With the arrival of March there have been so many things to do on the farm. Planting new seeds, transplanting seedlings, constructing netting for the vertical growing, preparing plots in the field for planting, and setting up water systems are just a few things on the to-do list here at JRF. Step by step everything is coming together nicely. We have expanded to the field out behind our original box set up and a nice section of land has been graded to prepare for zucchini, summer squash, and melon planting. If everything goes to plan, there will be an abundance of squash and melons for your eating enjoyment this summer. However lets not forget all the other good stuff coming your way! Cucumbers and beans have been planted in some of the vertical frame boxes and there are also freshly sprouted tomatoes, lettuce, peppers, cilantro, basil, chard, collard greens and kale underway! St. Patrick's Day is right around the corner and we thought it would be a great idea to have a special "green" sale for the holiday. Why limit yourself to wearing green when you can be eating green too! This Saturday come celebrate your St. Patrick's Day with some real greens from the farm and enjoy our special pricing for the day. Spinach will be available for $2 a bag and lettuce will be $2 a head or 3 for $5. We hope you will be able to join us! When it comes to increased health, it’s not just what we eat but how we eat. 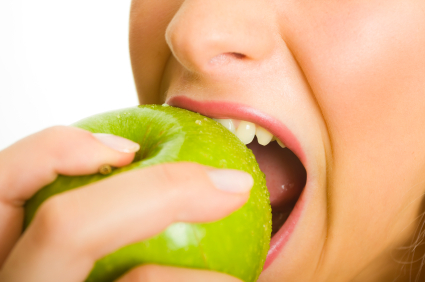 Digestion begins in the mouth, where contact with our teeth and digestive enzymes in our saliva break down food. But these days most of us rush through the whole eating experience, barely acknowledging what we’re putting in our mouths. We eat while distracted—working, reading, talking and watching television—and swallow our food practically whole. On average we chew each bite only eight times. It’s no wonder that many people have digestive problems. Chewing reduces digestive distress and improves assimilation, allowing our bodies to absorb the maximum nutrition possible from each bite of food. In fact, chewing can promote increased circulation, enhanced immunity, increased energy and endurance, as well as improve skin health and stabilized weight. Try eating without the TV, computer, smartphone, newspaper or noisy company. Instead just pay attention to the food, your breathing, and chewing. Quinoa (pronounced keen-wah), is a nutritional powerhouse with ancient origins. It was originally cultivated by the Incas more than 5,000 years ago; they referred to it as the “mother of all grains.” Quinoa grows best in mountain regions 10,000 feet above sea level and thrives in poor soil and extreme conditions. While quinoa is widely considered a grain, it's actually the seed of a plant called Chenopodium or Goosefoot, related to chard, spinach, and beets. 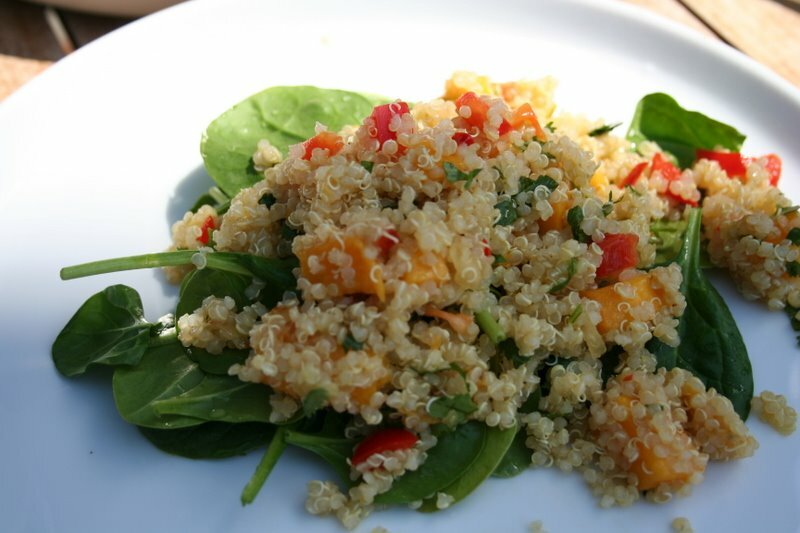 Quinoa is a gluten-free grain and has a similar effect as other whole grains in helping stabilize blood sugar. Quinoa boasts an impressive amount of health benefits. It contains all nine essential amino acids, making it a complete protein, which is very rare in the plant world. The fact that it is a complete protein makes it a great source of protein for vegans and vegetarians. 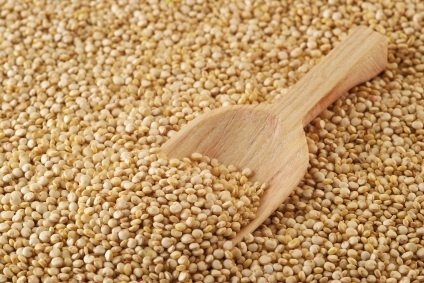 Quinoa is also high in magnesium, fiber, calcium, phosphorus, iron, copper, manganese, riboflavin and zinc. There is a lot of fiber in quinoa and this will help with preventing colon cancer, optimizing gut health, preventing constipation and bloating, and maintaining healthy cholesterol. The high fiber in quinoa also makes it idea for anyone trying to lose weight because it digests very slowly and will leave you feeling full for longer. Quinoa provides sustained energy and much more nutritional content than cereals or breads made with refined grains. Quinoa is also very rich in antioxidants that fight free radicals in the body and help prevent cell and DNA damage, which will eventually lead to cancer. The fact that quinoa is a gluten free grain makes it a great choice for people with digestive disorders such as celiac disease. For quinoa and whole grains in general, the majority of digestion occurs in the mouth through chewing and exposure to saliva. For optimal nutrition and assimilation, it is vital to chew your grains well and with awareness. For best results, rinse quinoa before you cook it or even soak it for a few hours or overnight. When cooked, it has a fluffy, slightly crunchy texture. Try it in soups, salads, breakfast porridge, or even as its own side dish. First put your quinoa in the rice cooker or cook it on the stovetop according to the package directions. Start heating up the black beans in a pot, throw in a pinch of your minced garlic and a few tomato slices, add the cumin, a pinch of salt, cayenne pepper and mix. Now cover and put on low or simmer. In a large pan start heating up the oil to medium. As the pan begins to warm throw in the rest of your garlic and sauté for 30 seconds. Then add your onions, bell peppers, and any other veggies you would like. After cooking those down for a couple minutes add your tomato and green onion. Stir frequently for 2 minutes. Now that you're done cooking the veggies it's time to serve. 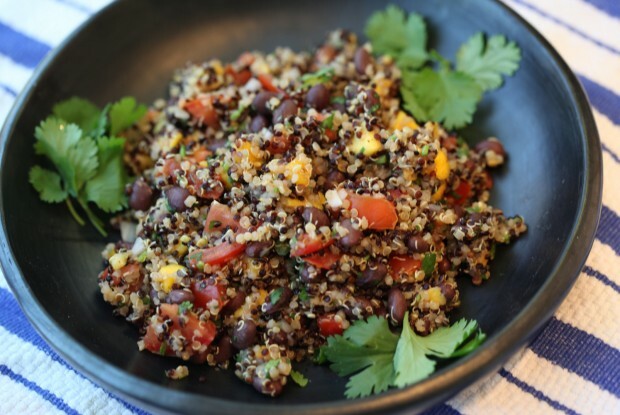 Place quinoa down on your plate first then add the black beans, and top it off with your cooked veggies, cheese, and garnish with cilantro. Now you have an incredibly tasty meal that's going to fight disease and fill you up JRF style! Broil the chicken and slice up later or slice up and stir fry in some unrefined coconut oil. Meanwhile throw the quinoa in the rice cooker or follow the instruction on the bag for stovetop preparation. Put all of the dressing ingredients in a bowl and mix thoroughly. Then put sliced up chicken in a bowl and mix in 1 Tbsp of dressing. Finally put the rest of the ingredients in the same bowl and add the rest of the dressing or as much as you see fit. Toss well and enjoy. For those of you who do not want chicken, it can be easily excluded from this recipe and the salad will still taste great. Is There Plastic In Your Food?